i finally finished my first real (i.e. non-virtual-console) game on wii u! whoo! 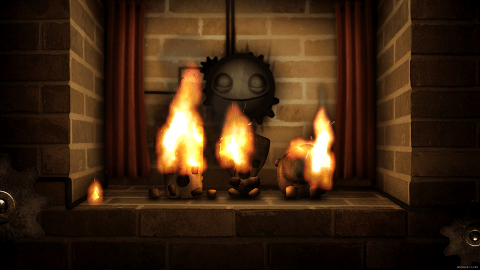 there’s no question that wii u has gotten off to a slow start, but while wrapping up a longer game on the system (stay tuned for my next post) i spent an afternoon playing through the downloadable indie title little inferno. this is going to be a relatively short review because what needs to be said about the game has been said in many places, but in particular i recommend checking out the reviews at lofi-gaming.org.uk, totilo’s review at kotaku, and nintendolife. i was wary of the game since by all accounts it was short and i’ve found that games that are hailed for being unique tend to be vastly overrated, not to mention that i’d tried their other major previous effort, world of goo, a while back and just hadn’t been able to get into it despite all the critical praise it had garnered. but this game can be appreciated on multiple levels. the core gameplay experience of burning things and discovering combos is entertaining enough, even for those not naturally pyromaniacally inclined, and you can also appreciate the incredible polish throughout, including fantastic art design and music. but for me and many other people it’s the surprising ending (in the form of what is basically an extended epilogue) that recontextualizes the entire game and makes the whole experience suddenly much deeper and richer: the game is a 21st-century fable and one of the most successful “experimental” games i’ve played yet. The test I want a good game to pass is simple: I want it to stick with me. I want it to seep into my thoughts days after I played it. Little Inferno is simple. It’s somehow both quaint and bold. It lingers. It burns brightly. It burns well. it’s not a game that i’ll be replaying any time soon, but it’s a game that everyone should play, and at its current price of $5 (on wii u and on ipad) there’s no reason not to catch this game, which offers a glimpse of a brighter future for video games as a genre. – if you’re looking for some good conversation about the game, check out this thread on steam. and here’s some discussion about trying to get a better ending (punchline: there isn’t one). – apparently there’s a wiki?